Select a Template below to fully customize text, color, size, and to view your changes instantly online. The most common size is a 12" x 24". This size will fit on almost any car or truck door. Click picture at left to see how the sign was created using this site. Discounts for bulk, identical, orders. 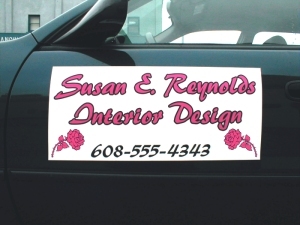 We want your custom decal business. Go Here to Submit your Designs for a free price quote.